Abstract: This paper attempts to study the methods adopted by Parijat Academy to empower the rural children through education as well as to know about the challenges faced during the process of implementing education. Furthermore this paper also tries to find out the changes that the school has brought among the children and in the whole region. Keywords: marginalized, education, school, tribal, children, students. Education is one of the principal fundamental rights which promote freedom of individual. It is also a significant tool through which marginalized section of the society can bring themselves out of their vulnerabilities. Nelson Mandela has truly said “Education is the most powerful weapon which you can use to change the world”. Though various initiatives have taken to raise the literacy rate in India but still some communities are alarmingly lagging in terms of education. Statistical data shows that the most educationally deprived sections of the society are Dalits officially known as Scheduled Caste and the Scheduled Tribes. Historically these SC and ST population have been exploited and deprived of their basic rights including right to education as well. Various literatures show that lack of awareness and understanding of education, conflict, cultural ethos, social customs, poverty and poor economic conditions, the gap between the home and the school etc. are the some of the factors which stand as obstacles in their path of attaining education. In order to reach these marginalized people the state, Civil Society Organizations (CSOs) and other development agencies have taken different initiatives. One such initiative taken by a concerned individual is the school Parijat Academy. This study was conducted in the month of March 2014 and is qualitative in nature. The primary data has been collected through direct observation and in-depth interviews with the founder of the school, teachers and students. Further the secondary data was collected through journal articles, newspaper and internet sources. Parijat Academy, located in the village Pamohi in the Kamrup district of Assam, is a school for deprived and marginalized children. This school was first started in 2003 with just four children with a pair of desk bench in a guhali (a place to keep cattles). The main goal of this school is to benefit the communities in Pamohi and nearby tribal villages by providing free education from kindergarten to class X. This school is functioning with the support of different volunteers, Civil Society Organizations (CSOs) and other development agencies. The village Pamohi and other tribal villages near to Pamohi witnessed a very high dropout rate of children both male and female. In fact the number of out of school children was also high few years back before the establishment of Parijat Academy. Rampant poverty and lack of awareness regarding the importance of education are the main reasons behind the high dropout and out of school children in these tribal villages. Beside poverty and educational backwardness, the other major issues of the Pamohi and the nearby tribal villages are alcoholism, teenage marriage and child labour. Karbi, Rabha and Bodo are the main tribal communities of these villages. The main sources of income are the agriculture and daily wage labour. Disturbed by the situations the founder of the school Uttam Teron has decided to take some measures to deal with the issue of educational backwardness of people and as a result he alone established the Parizat Academy with only four students. The school has achieved attention when an eminent journalist has written about the school’s contribution in 2006 and after this few development agencies have come forward with a helping hand. Different volunteers, organizations, schools and individuals have contributed significantly for the development of this school including the school building and the library. Presently the school has 12 class classroom, 510 students and 20 teachers. The educational qualification of the teachers ranges between Higher Secondary to Masters. Volunteers from across the world mainly from United Sates of America, France, Czech Republic, Ethiopia and Japan visit regularly and provide different kind of vocational trainings to the students. In order to provide a quality education and to create a suitable learning environment for the students, the school has taken different steps and according to Teron they have achieve success to some extent. The significant among the facilities are: it organize regularly health check up camp for the school children as well as for the villagers; provide vocational education of tailoring and embroidery to interested students; organize school exchange programme which provide a platform to bring the children of both underprivileged and privileged school closer and as such sensitizing them towards each other thereby reducing social disparity between the two. Important among all the programmes is the programme of weaving. In this programme the school provides weaving tools and thread to the students mainly girls. Interested female students use to weave after school. Remarkable thing is that the students weave clothes for their own school uniform and they themselve stitch the uniform. This weaving programme is also open for the financially weak women of the Pamohi and other nearby villages thereby providing an option for their livelihoods. Parijat Youth Club which consists of the Parizat’s ex students use to take classes on dancing, singing and drawing in the school whenever they get time. Moreover this school also facilitates hostels for the students of far villages who could not make to attend classes regularly due to the long distance. The hostels facilities are also provided in free of cost and the students just have to bring rice from their homes if possible. Ex-students from far forest villages who want to continue their studies in college also use to stay in the hostel of Parizat Academy in free of cost. Further it organizes parents meetings frequently and as such parents became aware of the importance of education. 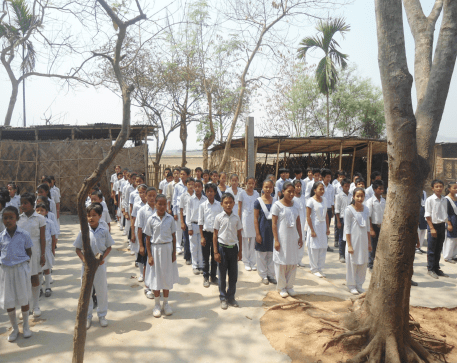 After the establishment of this school, there are hardly any dropout and out of school children not only in Pamohi but also in nearby tribal villages. According to Teron earlier he had to convince parents to send their children to school but now the situation is much better. Parents became aware regarding the importance of education and they themselves send their children including daughters, in fact now the enrollment rate of girls is higher than the boys. One of the significant achievements of this school is the academic performance of the students. There are students who have made such a good results in board exams though they were earlier dropout for three-four years. There is no doubt that this school has achieved success in creating a suitable learning environment for the children. In short this school has brought awareness among the inhabitants of the Pamohi and other nearby tribal villages regarding the importance of education and create an environment to attract children by not only imparting formal education but also vocational trainings and as the children are now attending school and parents are becoming aware, the problem of child labour in the villages have reduced to a great extend. But still there are children who worked as par-time child labour during vacations and holidays. Many more rural villages in India are there where the education is still a distance dream of children. There are schemes like Mid Day Meal, Sarva Siksha Abhiyan and Act like Right to Education but still the country has failed to achieve the desired level of literacy. Still the country has dropout and out of school children in large number. The problem of educational neglect of child cannot be tackled with just certains schemes. It is clear from the statistics that these schemes have not achieved full success in tackling the issue of school drop out particularly among the tribals. A study by Indian Council of Social Sciences Research (ICSSR) has revealed that 75 per cent tribal children in 22 districts of Rajasthan are lagging behind in education and tribal girls are no more enrolling in schools (Deccan Herald, 15th Feb.2014). Teacher’s absenteeism, discrimination from non-tribals teachers and classmates, no proper toilets and drinking water facilities, poor quality of teachings, lack of enrollment campaign etc. are some issues associated with the Government schools and these are the reasons why still the children from marginalized communities lagging in education. Another important point is that the tribal communities are mainly isolated and exploited communities. The problem of educational neglect of tribal children will not solve till their own communities are alienated and deprived. In the article Isolated Communities and Ignored Claims: Tribal Children’s Right to Education in India, Archana Mehendale has rightly argued that tribal children’s rights are more likely to get realized if rights of tribal communities are historically recognized and fulfilled. In order to reach the marginalized communities and to deal with their issue of educational backwardness, the present government schools and the schemes are not enough. The need of the hour is to provide these communities an environment where they do not feel alienated and exploited and where their children will get a quality education with other facilities for their holistic development. One such type of school is the Parijat Academy which aim is to reach the children of marginalized communities. This article was published on 5th June: World Environmental Day, in Global Education Magazine.